Language Name: You can select the name of the language from available language drop-down list. Title: Type-in the title for the language you have selected. 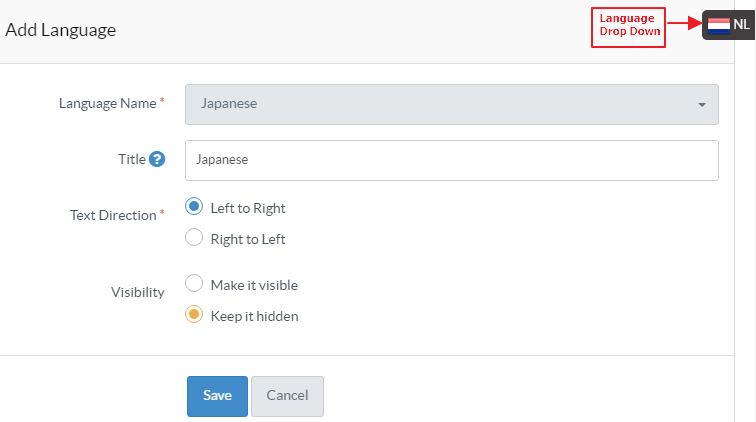 This language title will be displayed in the language drop-down of both admin section and front end. Text Direction: You need to set the direction of the text for the selected language. Languages like Arabic are written in RTL(Right-to-Left) direction in which writing starts from the right of the page and continues to the left. If Left to Right is checked, the text will be written from left to right side and vice versa if Right to Left option is selected. Visibility: You can set the visibility of the language in the front end as either visible or hidden. If Make it Visible is checked, all the features of language such as categories, articles would be accessible by front end users vice-versa for Keep it Hidden. Click "Save" button to add the language file to knowledge base otherwise, you can click "Cancel" button to abandon the process.